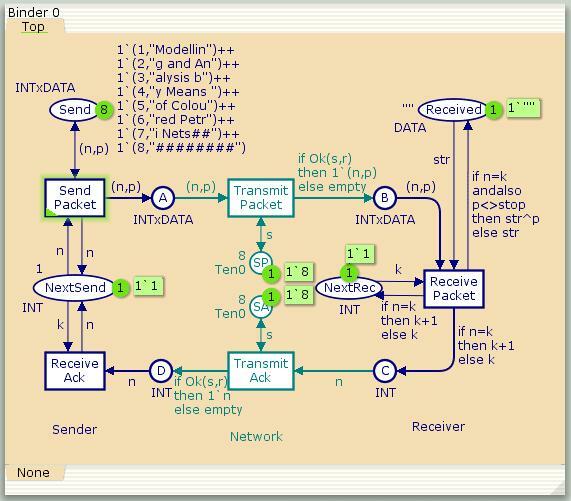 This is a small toy example describing a simple protocol by which a sender can transfer a number of packets to a receiver. The communication medium may loose packets and packets may overtake each other. Hence, it may be necessary to retransmit packets and to ignore doublets and packets that are out of order. Use, Monographs on Theoretical Computer Science, vol. 2:Analysis Methods. The files for this net can be found in a subdir of cpntools called Samples\\SimpleProtocol.